When winter hits Maine and the snow is deep, the sport of snowmobile touring, brings an annual influx of travelers to Maine’s winter wonderland. Most people race from point “A” to point “B” putting on hundreds of miles over a weekend. The interesting part of this type of travel is they miss what this snowy world has to offer. The picturesque landscape is a photographer’s dream. Safe, leisurely travel through this great State provides many opportunities to see interesting & historical sites, nature in its own habitat and environment. You’ll also experience scenic views that are only accessible by snowmobile in the winter or long hikes in the spring, summer, or fall, that many can’t physically undertake. Let your mind wander while traveling the snowy backcountry, viewing Deer, Moose, Fox, Coyotes, Rabbits, and Ruffed Grouse in their wintry habitat. View from a mountaintop a spectacular vista spanning over a hundred miles. Enjoy a mid-day hot lunch prepared by your Maine Guide while enjoying your outdoor experience. Get away from the noise and traffic of a busy life; relax in the quiet of the woods and meadows of a wintry wonderland. 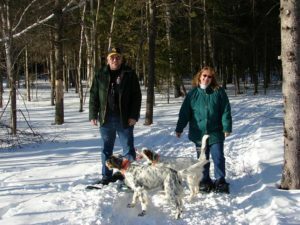 A slow, quiet pace on snowshoes will bring you into the winter habitat of deer, rabbits, grouse, and other native Maine animals and birds. Whether to relax and enjoy the sights of winter and the tranquility of the woods or to find wildlife and birds to photograph, you will enjoy your snowshoeing trip and sleep very well that evening after a day in the fresh clean air.